The surface of the stone filling lies at 3.0 m above tidal low water and is thus exposed to the waves. Not until the concrete head, 8.0 m wide and 2.40 m thick, has been concreted, can the Manitowoc 4600 continue to drive forward. 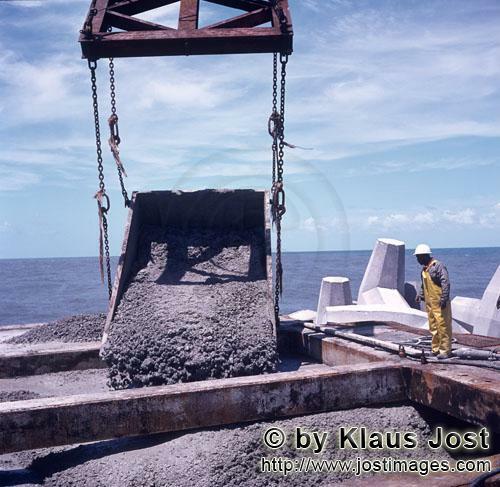 The stowing of the heavy steel formwork is carried out by the Manitowoc, likewise the filling of the concrete. The steel formwork is constructed in such a way that it transfers the weight of the Manitowoc onto the stone filling. In this way it is possible immediately after concreting to drive the crane forward onto the freshly concreted block.